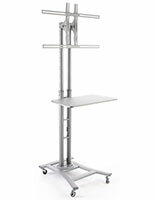 These mobile LCD stands with wheels allows users to raise and lower the presentation screen from 44" all the way up to 71.5" high as desired. 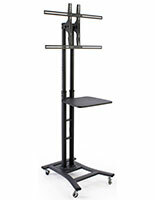 The wheeled presentation equipment racks have eight height positions for advertisers to choose. 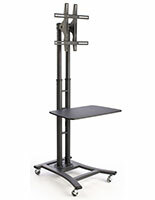 These freestanding LCD stands for business use, also known as flat screen television holders, come with an Allen wrench that makes adjusting the heights easy. The flat panel presentation displays have a silver finish that offers a stylish look in high traffic commercial environments. 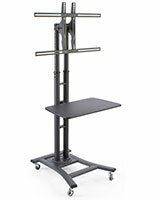 These portable LCD stands with wheels include a sturdy MDF equipment shelf that attaches to the front and rotates. 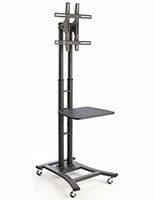 The shelving is are also height adjustable to one of three pre-set levels. 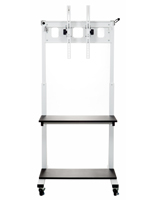 These wheeled LCD stands for business use come with all of the necessary hardware for installing a 37" to 65" a flat panel monitor to the VESA-compaticle bracket. Some screen models may require a slightly different screw that can be found at most hardware stores. 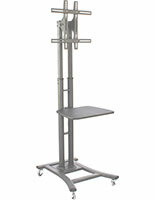 This freestanding LCD stands feature four caster wheelss to easily relocate the fixtures as desired. Each wheel has a lock on the bottom for ensuring the models remain in position during use, making them a great choice for showcasing presentations in business environments as well as for digital advertising in retail and commercial locales. 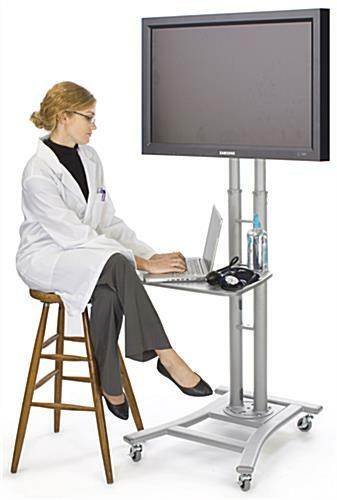 These portable stands with wheels can tilt LED flat panel monitors downwards up to 15° for maximum visibility in public. The flat screen television holders hold 37" through 65" no heavier than 110 pounds for a large widescreen visibility suitable for training areas and other educational environments. 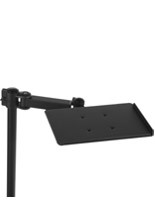 These rolling LCD stands offer a VESA-compabile mounting bracket to best mount name brand televisions. 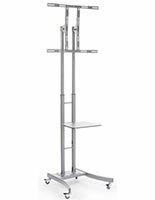 The aluminum frame TV racks are shipped out unassembled for lower price points but come with instructions and hardware for simple, fast construction. The commercial-grade flat screen television holders are durable and will stand up for years in heavily trafficked areas!